Since our discovery with Ellie Krieger's Vanilla Spice Oatmeal that our heart healthy oatmeal breakfast doesn't have to be boring, we have opened our minds to new recipes. As last week's heatwave has vanished, our mornings have turned a bit chilly and a toasty bowl of steaming, flavored oatmeal really hits the spot. Thanksgiving's pumpkin theme turned us to pumpkin for breakfast in the form of a delightful, pumpkin pie reminiscent oatmeal. Two versions of the spice laden oats have graced our tables this past week. Both were popular and somewhat similar, but different enough to give you both versions. Liv preferred the oven baked version, slightly sweeter and enhanced with a touch of orange peel while my son preferred the stove-top, more porridge-like version, made dairy free. With the ability to bake the oven version in advance, it makes a nice early morning alternative. Simply mix and bake the evening prior, store in the fridge overnight and reheat quickly in the microwave for a quick, flavorful and heart healthy start to your day. The Walnut Streusel gives a nice crunch and an additional flavor boost. This being our first experience with baked oatmeal, we were a little surprised with the denser, almost muffin-like texture. I'm thinking that if I tipped the oatmeal out of the ramekin it would most definitely hold it's shape - not the usual "porridge-like" texture that I'm used to, but wonderful nonetheless. The small amount of freshly grated orange peel added a wonderful layer of flavor. The stove-top version gives a nice steaming bowl of hearty goodness in about 10 minutes. 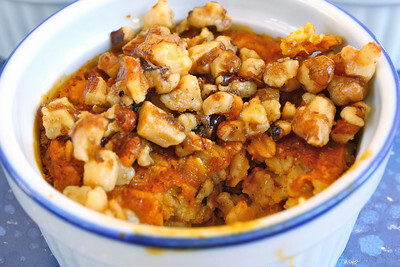 Flavored with the pumpkin and pumpkin pie spices, studded with plumped raisins and dried cranberries and topped with generous scoop of walnut pieces, this steaming bowl is sure to warm you from head to toe. Combine the dry ingredients, oats through raisins, and whisk to combine. In a separate bowl combine the pumpkin, orange peel, milk, water and vanilla. Whisk to combine. Add the wet ingredients to the dry ingredients, stirring until combined. Let mixture stand on the counter for about 1/2 hour. While the mixture is resting, preheat oven to 375º and spray 4 individual sized ramekins with cooking spray. After allowing the mixture to rest, ladle into the ramekins. Place on a foil lined baking sheet and bake for about 10 minutes. While the oatmeal is baking, mix together the streusel ingredients. At the 10 minute point, remove the baking sheet with the ramekins and divide the streusel evenly. Return the baking sheet to the oven and continue baking for about 10 more minutes, or until the oatmeal is set. Remove from oven and allow to cool slightly. Serve with milk if desired. Place first 9 ingredients (oats through raisins or cranberries) into a saucepan over medium heat and stir to combine. Just as the mixture begins to boil, reduce heat to low and simmer, stirring occasionally, about 5 minutes. When done, remove from heat and pour into a bowl. 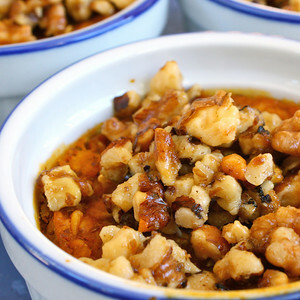 Top with a drizzle of honey, a sprinkle of walnuts and milk if desired. I love the one with all the nuts on top! Wish I had some right now actually! As much fun as I had this weekend, I missed reading all of you just as much! I do hope we get to meet one day, my town or yours! great breakfast ideas. it really gets boring to eat the same oatmeal or muesli every day. thanks for sharing. This is one healthy breakfast. Here the temperatures are very high for the season.It reminds spring and not the beginning of winter. These both look so great. I miss oatmeal, it's a little much for my blood sugars, but if I could have it, I would surely make this! Both versions sound really great. I love make ahead breakfasts like the baked one. I often do the vanilla-spiced oatmeal. The pumpkin is just too much fun for this of year. As we have oatmeal 3-4 times/wee, it's nice to spice it up a bit! Sweet breakfast recipe! 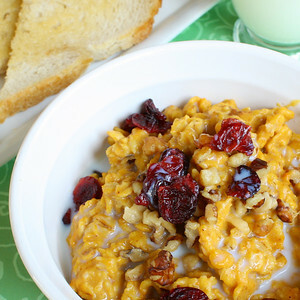 We love oatmeal in our house and these are very creative and full of flavor! They look incredibly delicious!! Haven't had oatmeal for breakfast in a longgg time.. should really consider making something like this really soon. my son is going to love this so much! thanks cant wait to try this! I like all your experiments with oatmeal! You are making me discover a whole new way to have breakfast. Now I will have to see if this pumpkin oatmeal surpass the vanilla spice one. Hey, if Gina comes to visit you I want to come too :) We missed you at the festival! I have been eating oatmeal all week! Would love to try both of these - the baked one sounds particularly enticing! Especially with the streusel topping. I appreciate the sweet comment you left me - thanks a lot! I was happy you 'got' me and my plastic container collection! With all the changes I am making to my diet this is the PERFECT meal for breakfast. Love it! I enjoy oatmeal but it does get boring after awhile even eating the usual maple and brown sugar. I will definitely have to try this in the morning, thank you! These are both gorgeous! So wish I could instantly transport this to my breakfast table right now. A delicious seasonal idea. Thank you! Now there's some good-looking oatmeal! Honestly, I really thought I'd go my whole life without uttering those words. But it does look fantastic! We are having this for breakfast in the AM just FYI. Another winning idea! Sorry I'm behind in my reading but I just had to see what you're up too...and it's good as usual. I hope you had a good week. Your baked pumpkin oatmeal looks so good. I'll have to try this one. Ohhh, I can't wait to try this oatmeal!!!! i have observe that most of your recipe here are has common ingredients which is the pumpkin but really love the way your pumpkin made. Ellie would be SOOO proud! This looks so scrumptious!! Girl, you have so many recipes I am wanting to try!! You're giving Ellie a run for her money! I love oatmeal and I love pumpkin, so I've been adding it to my morning breakfast too! Yours is much more beautiful though ;) and I'll have to give the whole "baked oatmeal" idea a try! Thanks for sharing! I made the stovetop version a couple mornings ago-- DELICIOUS! Modifications I made: half skim milk/half water (all milk would have been too rich for my tastes), extra ginger- probably 2 to 4 times more (going for the extra anti-inflammatory effect! ), accidentally forgot the salt, added about 1 Tbsp flax meal, and served with agave nectar + toasted slivered almonds. This was almost two servings worth in the end, and SO yummy. Thanks for the recipe!